Slam dunk action at Telfar, pyjamas at Diesel and Marc Jacobs makes the world's most impossible shoes to walk in. We started today with something refreshing for NY fashion week; a young designer who has decided to opt out of the commercial rat race that NY fashion week is known for and instead approach a show with an element of spontaneity and excitement. Telfar’s show styled by Jason Farrer, was set in an old basketball gym on Mulberry Street. 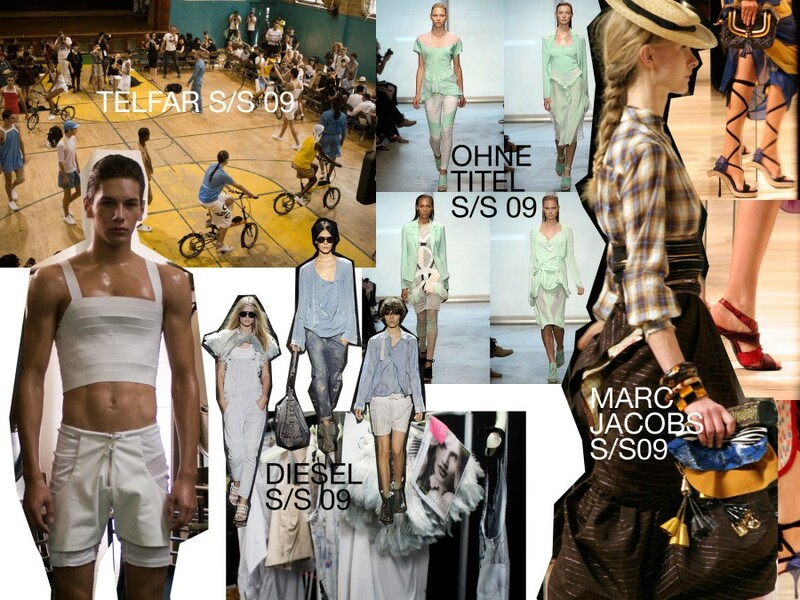 Basketball and physical ed seemed to be the big inspirations behind the S/S09 collection. Every model was glowing with perspiration, utility wear in sporty fabrics reigned and figure hugging menswear played out with a European inspired influence from the likes of Bernhard Willhelm. There was also an innovative use of mesh materials, not to mention the outbreak of models on bicycles towards the end of the show. All of this combined to make this another competent show from one of New York’s most innovative young talents. From Telfar, Katie and I went for some lunch at the Bowery Hotel’s restaurant and then onto the Diesel show, which was quite a contrast to this morning and the pyjama fabrics and soft pastel blue denim looks ware a particular highlight. Then onto Ohne Title for a splash of mint green and Bumble and Bumble treats. From there we went to Zegna, where grey, blue and fleshy short sleeved knits with quirky knitted patterns balanced out the suiting of the same palette, worn by models such as Tyler Riggs and Trent Kendrick to name a few. The day finished with a packed out crowd for Marc Jacobs, so crowded, people were sitting all down the stairs and all around the seating areas. Huge mirrors blocked the runway for models to walk in and around, creating a kind of kaleidoscopic effect and repetition of looks. With so many looks in the collection and with each model wearing one look, this was a really exciting show, inspired by the glamour and glitz of the 1940's New York, Art Deco, the Chrysler building and smoky Jazz cafes. Molls and broads shimmied down the runway decked out in school girl plaits and wicker hats, mixed with metallic fabrics and eclectic thrift shop style mis-match suiting and quite possibly the trickiest shoes to walk in ever!